FAIRHAVEN, Mass. — Southcoast Health held its annual Celebration of Hope event at the Southcoast Centers for Cancer Care in Fairhaven this past Sunday. The event, which was created to honor those who have undergone or are undergoing cancer treatment at the Cancer Center, welcomed more than 750 guests, including 207 former or current cancer patients. “This is a really wonderful event for all of us. It’s a chance to celebrate the strength and courage of our patients, the dedication of our cancer care team, and a great reminder to all of us how important our human connections are,” said Dr. Elizabeth Blanchard, Chief of Hematology & Oncology at Southcoast Health. The Celebration of Hope was coordinated by Kathy Tsonis, Oncology Outreach Coordinator, with Dr. Tushar Kumar acting as master of ceremonies and Dr. Sonia Seng introducing keynote speaker Julia Saulino, CEO of the FLY Foundation. Sharon Jenson, a local musician, capped the speaking program with an emotional rendition of Andra Day’s “Rise Up”. 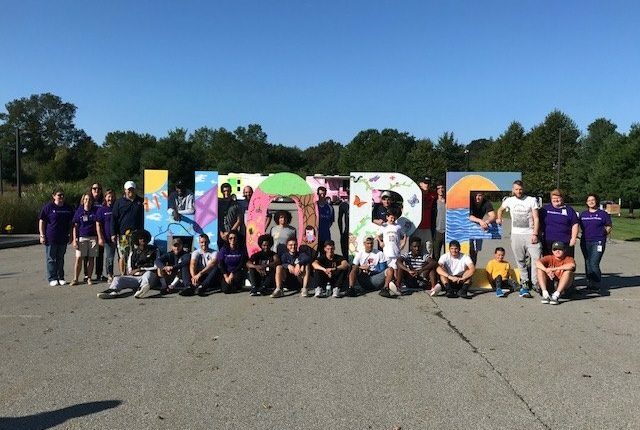 More than 100 volunteers, including Southcoast Health employees and their family members, the UMass Dartmouth Men’s Soccer team and the Dighton-Rehoboth Girls’ Soccer team helped make the event possible along with sponsors and donors. Donations and contributions were made by Epic, Claflin, Takeda, BayCoast Bank, Blount Fine Foods, EasCare, Gloria Gemma Foundation, Astra Zeneca, Boehringer Ingelheim, Lilly, Tesaro, Celgene, Puma Biotechnology Inc., BankFive, Imtra Corp, Dunkin Donuts – Acushnet, Foster Grant Sunglasses, LuLaRoe, Home Depot, Jose. P. Carvalho Family, Coca-Cola Bottling Company, and Rick’s Music World. The “Taste of Hope”, a free lunch for guests, was made possible by the donations of a number local eateries, including Dorothy Cox, NYAJ’s, Pasta House, Buffalo Wild Wings, Dominos Pizza, Fronteira Grille, Brazilian Grille, Brew Fish, Fays Dartmouth, Wicked Kickin’ Cheesecakes, Polar Beverage, Holiday Bakery, and Tropical Smoothie. For more information about the Southcoast Centers for Cancer Care, visit www.southcoast.org. To get involved in next year’s Celebration of Hope, contact Kathy Tsonis at 508-973-3077.